R.W.Bro. Professor William E. Thrift, W.M. 1917. The only Englishman in recent times to have been appointed Provost, W.E. Thrift was born in Yorkshire but came to Ireland as a boy. He graduated from Trinity College in 1893, with gold medals both in mathematics and experimental science, and was elected Fellow three years later. He was Professor of Natural and Experimental Philosophy (Physics) from 1901 to 1929; in 1935 he was appointed Vice-Provost. When Gwynn resigned the provostship in April 1937, the Junior Fellows invited the non-Fellow Professors to join them in nominating a successor and Thrift was duly nominated and appointed by the government. He was an excellent administrator and an effective representative of the University in the Dáil from 1922 to 1937. The death of R.W. Doctor Thrift is one of the greatest losses the Masonic Order in Ireland has sustained for many years. Few Brethren have had so distinguished a career in Masonry and none has given greater service to the Order in all its branches. He was initiated in Trinity College Lodge, No. 357, Dublin, in the year 1897, and occupied the Chair in 1911. In the Grand Lodge of Ireland he served in all the offices up to that of Senior Grand Deacon, and represented the Grand Lodge of Peru at the Grand East of Ireland. He also held the position of Hon. Secretary to the Masonic Girls' School from 1920 to 1923, when, owing to pressure of other business of great importance, he had to resign that office. In the outside world he was no less distinguished. He had an exceptional career in, his undergraduate course in Trinity College and eventually obtained Fellowship in the year 1896. He later on held the position of Erasmus Professor of Experimental Philosophy, from which he retired when he became Senior Fellow in 1927. 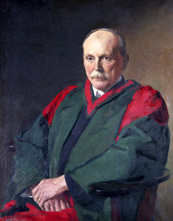 Brother Thrift in 1937 was appointed to the Provostship of his old University.